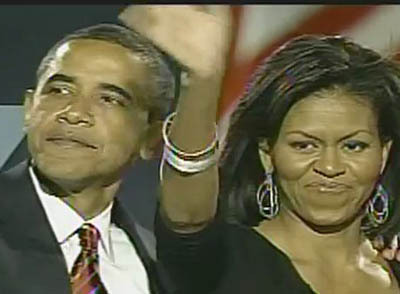 Barack and Michele Obama wave to the crowd at his acceptance speech, Grant Park, Chicago. Barack Obama created history Tuesday night, becoming the first non-white to win the United States Presidency. Thousands thronged cities all over the country to celebrate what until a few months ago even might have seemed an impossible dream. His Republican rival, John McCain, was gracious in defeat, pledging his full support for the president elect, and President George W. Bush called Obama to offer his congratulations. Obama was magnanimous in victory saying he would strive to be president for all Americans and ofered an ear for those who did not vote for him. Jesse Jackson, widely viewed as the first serious African American contender for the presidency, who ran in 1984 Democratic Party primaries wept quietly as he waited for Obama to begin his speech, and during the president-elect’s presentation. 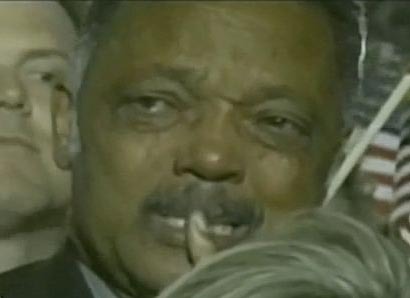 The rev Jesse Jackson weeps as Barack Obama addresses the crowd in Chicago. Jackson was a supporter and colleague of civil rights leader, Dr Martin Luther King Jr, who in a 1968 speech, had envisioned a time when blacks could achieve the highest success in the USA, and Obama recalled King’s legacy in his acceptance speech.